Staphylea trifolia.flowers .© Copyright Bobby Hattaway 2011.discoverlife.org (Accessed 5/2015). Staphylea trifolia is a shrub to 5 m, stems erect, bark gr eenish-striped. 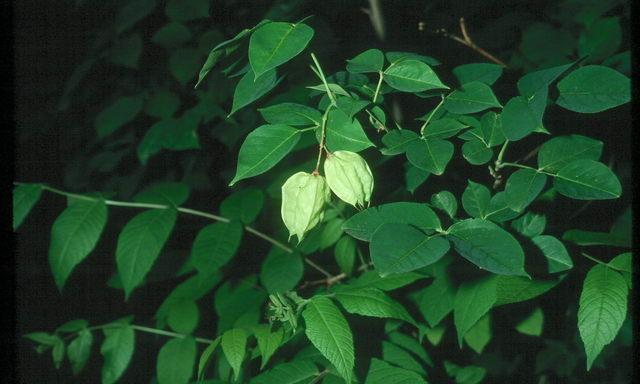 Leaves opposite, 3-parted, leaflets oblong, elliptic or egg-shaped, to 1- cm long, margin toothed, terminal leaflet long-stalked, stalks of lateral leaflets short to none. Flowers greenish-white, bell-shaped, to 1 cm long, calyx petal-like, nearly as long as petals; inflorescence of drooping clusters to 10 cm long; blooms May. 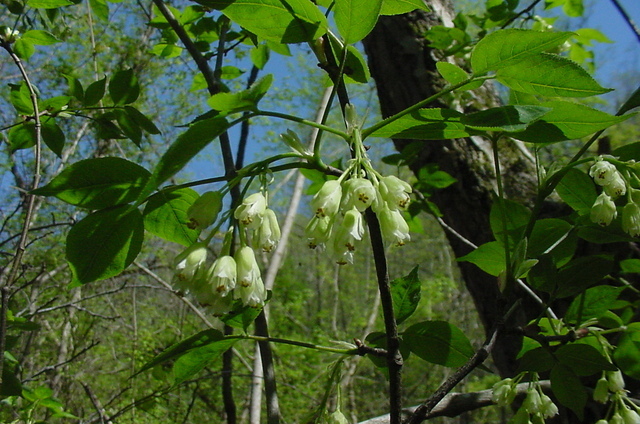 Staphylea trifolia. fruit.© Copyright Bobby Hattaway 2011.discoverlife.org (Accessed 5/2015). Fruit dry, an inflated, thin-walled 3-parted capsule to 5 cm long, splitting open at top to release seeds. Habitat: Moist woods and edges in rich, often rocky soil, pH 6-8. Tolerant of shade. Moderately tolerant of drought, flooding (Hightshoe 1988).